The G30 BMW 5 Series has been spied once again on public roads in its run-up to take on the new W213 Mercedes-Benz E-Class. But while the E-Class’ debut is set to take place in a matter of days now, we may have to wait a little longer for the full unveiling of the next-generation 5 Series. Just like the spyshots we brought you before, a heavy amount of camouflage continues to mask the car’s exterior details. Peeking past the disguise, we can see the 5er’s new headlamps and wider front grille. Wrap-around tail lights with new lighting graphics are visible at the rear, and it also appears that the sporty sedan has received a set of new stylish tail pipes. 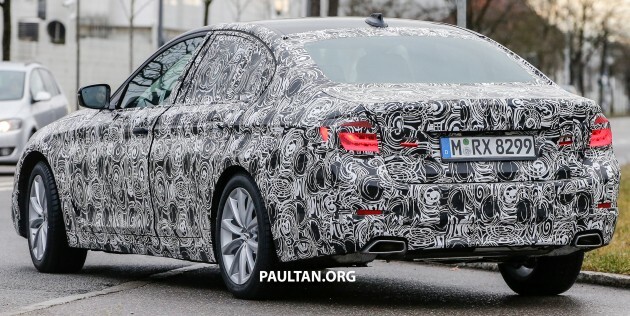 We’ve also had a glimpse of the G30 5 Series’s cabin when we spied a wagon version being tested at the Nurburgring. While the interior styling remains loyal to BMWs before it, the car notably features a very large free-standing display screen, a gear lever and an iDrive controller straight out of the G11 7er, and unique central air vents on the dash. Adopting styling and tech elements from the new G11 limousine, the G30 executive sedan will also ride on the brand’s new CLAR platform (formerly known as 35up) which utilises a mixture of carbon-fibre reinforced plastic (CFRP), aluminium and magnesium in its construction. Given the extensive use of CFRP on the new 7 Series, don’t be surprised to see the next 5er follow suit with lightweight body panels of its own – particularly for the roof, bonnet, boot lid and door skins. Reports suggest that this may reduce the overall weight of the new 5 Series by 100 kg against the current F10. Performance-wise, there’s no reason to expect anything but BMW’s latest four-, six- and eight-cylinder TwinPower turbo petrol and diesel engines. A plug-in hybrid variant has also been spied in the past as well. We understand that BMW may also introduce a 5 Series variant that will be powered by its new three-cylinder TwinPower engine. While it will surely prove economical, the idea of a 1.5 litre three-pot under the hood of a 5 Series may not be the most appealing proposition for customers in markets such as ours. Same old same old… Yawn! From the exterior, I have to say it looks pretty good so far – better than the G11 7 series. I’m hoping they don’t do the overly shiny G11 buttons on the G30, the metal buttons on the G11 look too polished, that makes it look cheap. Wassup old man, here’s hoping the G30 is completed and ready in Malaysia by mid 2017! Held off on upgrading to a 6…drove my friend’s 6 (bugger’s network-switches business is booming like hell!) and the car felt extremely lowwwww for my tastes. Despite being an NA the mazda packs a punch though. Any plans on you getting a bmw 7 or the next E krass? Haha, the Mazda 6 does have a lower hip point than the others in the market, so not surprising. But a very good car nonetheless, alongside the Ford Mondeo. For now, depends la. Not a 7er, that thing is too big, and I did consider the E krass but after I saw the pictures of the exterior, I’d just wait for the G30 – what was Merc thinking, fantastic interior, stretched exterior – oh my! Stoked. Although i think i can guess what the real mccoy will look like. obsolete again my car. gonna save up some for this new beauty. I hope i am wrong, but the overall shape looks like the f10 only with the new 7 series headlight. After the disappointing new e class, i hope bmw wont play it safe and will take more risk instead of making it a mini 7 series. And please, no 3 cylinder 5 series!!! 4 cylinder is already bad enough! The 4 cylinder petrol engine sounds like a diesel! Why bother, in 7-8 years time it becomes a RM40K car. That is how much a 8 year old 735i is now! Looks better than the new E-Class already. Well, the 3 cylinder engine is also in the i8 sports car, albeit with sporty “sound”. And I have seen quite a few i8s around in KL. So maybe Malaysians have warmed up to a 3 cylinder engine being used for luxury or sports cars. Anyways, to these eyes, the upcoming E Class looked better in camouflage than this new 5 Series does in camo. But in the end, when the camo came off, the new E Class ended up looking like the C Class, which is a handsome car, but one was expecting a bit more differentiation between them. is the g30 using FULL LED tail lights or is the reverse lights still with lightbulb? is the g30 using full LED tail lights? or do they still using lightbulb for the reverse light?